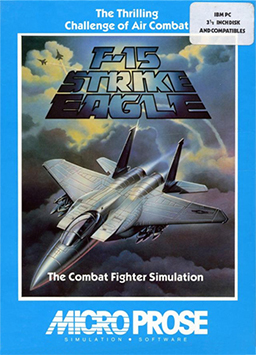 F-15 Strike Eagle is an F-15 Strike Eagle combat flight simulator first released in 1984 by MicroProse. It is the first in the F-15 Strike Eagle series comprising also the sequels F-15 Strike Eagle II and F-15 Strike Eagle III. It was initially released for the Atari 8-bit family, Apple II, and Commodore 64, followed by ports to other systems. An arcade version of the game was released simply as F-15 Strike Eagle in 1991. It uses higher-end hardware than was available in home systems, including the TMS34010 graphics-oriented CPU. The game begins when the player selects Libya (much like Operation El Dorado Canyon), the Persian Gulf, or Vietnam as a mission theater. Play then begins from the cockpit of an F-15 already in flight and equipped with a variety of missiles, bombs, drop tanks, flares and chaff. The player flies the plane in combat to bomb various targets including a "primary" and "secondary" target while also engaging in air-to-air combat with enemy fighters. The game ends when either the player's plane is destroyed or when the player returns to base. The game was ported to the IBM PC, being one of the first games that the company released for IBM compatibles. The initial IBM release came on a self-booting 5.25" floppy disk and supported only CGA graphics, but a revised version in 1986 was offered on 3.5" disks and added limited EGA support (really just the existing CGA graphics, but with the ability to change color palettes if an EGA card was present). The popularity of F-15 Strike Eagle led to several more ports on the ZX Spectrum, MSX, Amstrad CPC, NES, Game Boy, and Game Gear. F-15 sold 250,000 copies by March 1987, and over 1.5 million copies overall, and was MicroProse's best-selling Commodore game as of late 1987. Computer Gaming World in 1984 called F-15 "an excellent simulation" with "excellent documentation". It stated that "the action is fast and furious ... the graphics are excellent". The game won the "Action game of the Year" in the magazine's 1985 reader poll. In a 1994 survey of wargames the magazine gave the title two stars out of five, stating that "The first 'classic' fighter simulation" was "well loved in its time" but "extremely dated". Antic approved of the Atari ST version's graphical and speed improvements, and ability to save progress. Compute! listed the game in 1988 as one of "Our Favorite Games", stating that it "makes jet fighter combat nerve-wracking and fun at the same time". ^ "F-15 Strike Eagle". Killer List of Video Games. ^ "Management, Trevor Chan". Enlight Software. n.d. Retrieved 27 August 2007. ^ "2006 Walk of Game Inductees, 2006 Lifetime Achievement, Sid Meier". Walk of Game. n.d. Archived from the original on May 29, 2007. Retrieved 27 August 2007. ^ Battles, Hosea Jr. (December 1984). "F-15 Strike Eagle". Computer Gaming World. p. 39. ^ "Our Favorite Games". Compute!. May 1988. p. 12. Retrieved 10 November 2013. This page was last edited on 12 February 2019, at 08:12 (UTC).